Microsoft has been fairly quiet about what’s coming in Office 2019, but features that have rolled out to Office 365 provide clues. We explore the likeliest additions to Office 2019. It’s getting close to time for the next major revision of the non-subscription version of Office. 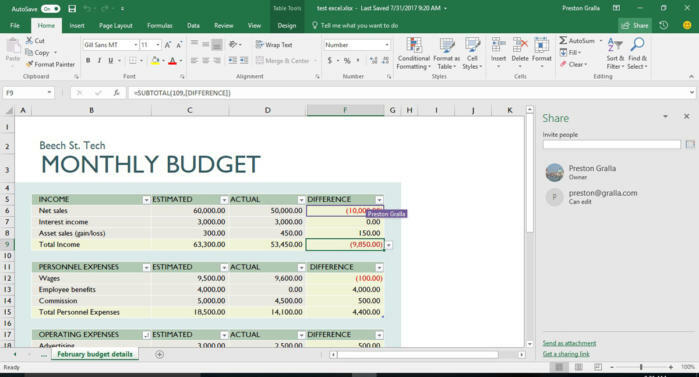 Office 2019 is expected to be launched in the second half of this year. Microsoft calls this the “perpetual” version of Office because you pay a one-time fee for it and own it forever, and it doesn’t get upgrades until the next major version is released. Based on that, we’ve looked at every single Office 365 update, examined each important feature, parsed Microsoft’s comments, looked at the features introduced in the preview of Office 2019 and made our best guesses about what features you can expect in Office 2019 when it ships. We’ve described them below, included details about how they work in Office 365, and taken screenshots so you can get a better look. We can’t guarantee that our predictions will be 100% accurate, but there’s a good chance we’re close. Keep in mind that Microsoft continually updates Office 365, and some future updates might make their way into Office 2019. So check back here regularly to see if there are any new features you can expect to see. When Office 2016 was released, Word, PowerPoint and OneNote all got online collaboration tools. Those tools allow people to work together on documents in real time, as long as they’re stored in OneDrive, OneDrive for Business or SharePoint Online. In July 2017, real-time collaboration was finally brought to Excel in Office 365. So there’s a reasonable chance it will also show up in Office 2019. When they accept the invitation and edit the workbook at the same time you do, you see the changes they make in real time via a colored cursor that indicates their presence in the file. (Each person collaborating gets a different color). Your cursor also shows up on their screen as a particular color, and they see the changes you make. When someone does work such as entering data or a formula into a cell, the changes appear. Put your cursor on another person’s cursor, and the person’s name appears above it, making it even easier to see what people are working on. Usually all this happens in real time, although there can be a several-second lag if any people are using a slow or flaky internet connection. No more details were provided. There’s a good chance, though, that among them will be those added to Excel in a big Office 365 update in February 2016. At the time, six new functions for editing formulas were added. The TEXTJOIN and CONCAT functions allow you to combine text strings from ranges of cells with or without using a delimiter separating each item, such as a comma. You only need to refer to the range, specify a delimiter, and Excel does the rest. Two other functions added were the IFS and SWITCH functions, which help specify a series of conditions, for example, when using nested IF functions. And the final two, MAXIFS and MINIFS, make it easier to filter and calculate data in a number of different ways. Get more details about them all here. Funnel charts, which will be added to Excel 2019, were also added during the February 2016 update. Funnel charts display values in multiple stages in a process. A funnel chart can show the number of sales prospects at every stage of a sales process, for example, prospects at the top for the first stage, qualified prospects underneath it for the second stage, and so on, until you get to the final stage, closed sales. Generally, the values in funnel charts decrease with each stage, so the bars in the chart look like a funnel. Get details about how to create funnel charts. 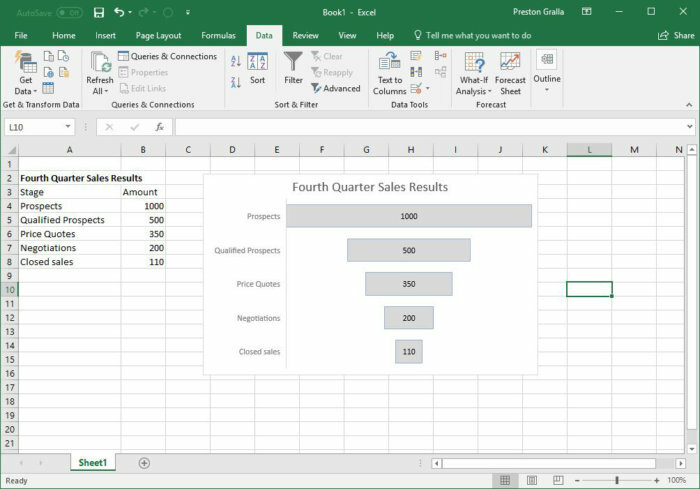 Funnel charts will be added to Excel in Office 2019. Map charts, which will be available in Office 2019, were introduced in a November 2016 update to Office 365. Use a map chart when you want to compare data across different geographical regions, such as countries, regions, states, counties or postal codes. By now, pretty much every word processing feature you can imagine has been baked into Word. So how can Microsoft continue to improve it? One way, judging by the additions to Word in Office 365 over the last two years, is to tackle the entire writing process, not just the act of writing. There’s a reasonable chance those changes will be carried into Office 2019 when it launches. Here’s how it works in Office 365 and will likely work if it makes its way into Office 2019. To translate words or phrases, first select them, then right-click your selection and choose Translate from the menu that appears. If it’s the first time you’ve used Translator or any other of Microsoft’s Intelligent Services, a screen appears asking if you want to turn them on. Click Turn On. You’ll only need to do this once, for Translator or any other feature that uses Intelligent Services. Do that and the Translator pane appears. The top of the pane shows your selection, and the bottom shows the translation. The top pane attempts to identify the original language, and I’ve found it does a good job of it. If it misidentifies it, though, simply select the right language. Then in the bottom of the pane, select the language you want to translate to. When you do that, the translation appears. To insert it somewhere into the document, move your cursor to the spot where you want it to appear, and click Insert at the bottom of the pane. You can also copy and paste any part of the translation into the document or another document. 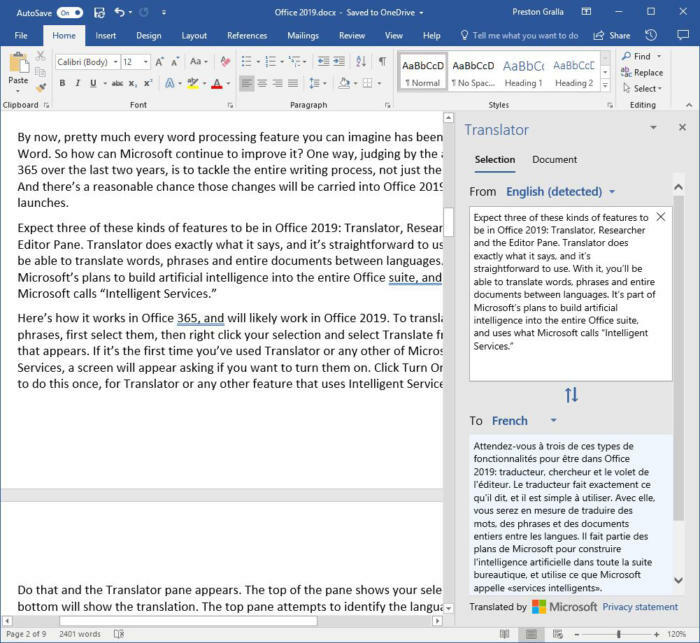 Word’s Translator is likely to make its way from Office 365 to Office 2019. As for Researcher, it’s a great way to do research online from right within Word. It’s much more effective than doing a plain internet search, because it uses only information from reference materials and sources Microsoft considers trustworthy, compiled by a service called Microsoft Academic Search. It also includes results from Wikipedia and Bing that it considers trustworthy. To use it, select References > Researcher, and the Researcher pane appears on the right side of the screen. Type in a search term at the top of the screen, and you’ll get a list of results. Click any to get to a page full of results from multiple sources, which you can then click to get even more details. Results come from academic journals, books and trusted websites. Especially useful is that Researcher integrates its content directly into Word. So you can turn a category of results into a heading in your paper. When you do that, a comment is also added to the document that includes a link that, when clicked, will display the original research in the Researcher pane of anyone who reads the document. Students and academics will welcome that it can add a citation directly from the Researcher pane into your document. You can also add text from the Researcher pane or add text and include a citation. Also expect the Editor pane to make its way into Word 2019. It replaces the Spelling and Grammar pane and adds a few new editing features, although nothing dramatic. It shows not just the misspelled word in the pane, but the text around it, making it easier to see the suggested correction in context. It also offers synonyms for its suggested corrections, so you get a wider selection of words you might want to use. Finally, it offers grammar rules to explain why it suggests changes. To use it, select Review > Spelling & Grammar from the Ribbon. There is one caveat to AutoSave: It only works on documents that are stored in OneDrive, OneDrive for Business or SharePoint Online. It’s one more example of the way in which Microsoft continually nudges you to use those services. AutoSave is significantly different and better than the AutoRecover feature built into Office 2016. AutoRecover doesn’t save your file in real time, so it’s easy for you to lose work. Instead, every several minutes it saves an AutoRecover file, so that you can try to recover that file in the case of a crash. But this feature doesn’t always work (for example, if you don’t properly open Office after the crash, or if the crash doesn’t meet Microsoft’s definition of a crash). And Microsoft notes, “AutoRecover is only effective for unplanned disruptions, such as a power outage or a crash. AutoRecover files are not designed to be saved when a logoff is scheduled or an orderly shutdown occurs.” And, of course, the files aren’t saved in real time as they are with AutoRecover, so you’ll lose several minutes of work even if all goes as planned. 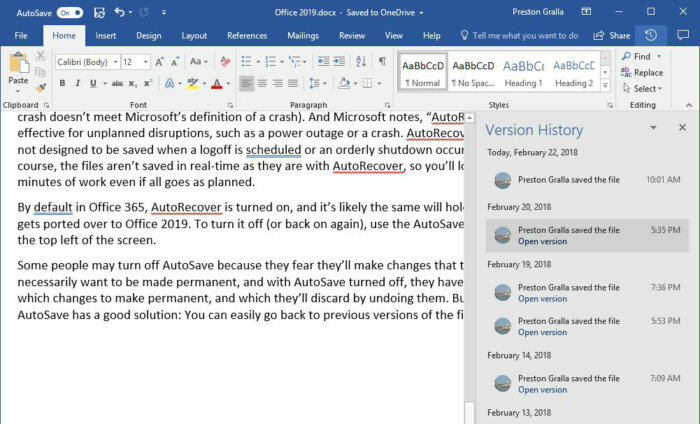 By default in Office 365, AutoSave is turned on, and it’s likely the same will hold true when it gets ported over to Office 2019. To turn it off (or back on again), use the AutoSave button on the top left of the screen. Some people may turn off AutoSave because they fear they’ll make changes that they don’t necessarily want to be made permanent, and with AutoSave turned off, they have control over which changes to keep. But here, too, AutoSave has a good solution: You can easily go back to previous versions of a file, review them, compare them side-by-side to your existing version, and copy and paste from your older file to your existing one. You can even restore an entire old version. To do it, when you have a file opened, click the file name at the top of the screen. A drop-down menu shows you the location of the file and a Version History section. Click “See all versions,” and the Version History pane appears on the right side of the screen with a list of the previous versions of the file, including the time and date of the last time they were saved. Click “Open version” and that version appears in a new window. Scroll through the version and copy any content you want. If you want to compare it to your current version, click Compare. To restore it, click Restore. Note that there’s even a shorter way to display the Version History pane: Click the Version History button on the upper-right corner of the screen (it looks like a clock surrounded by a circular arrow). AutoSave does more than automatically save your files — it also lets you open previous versions of them and restore any if you wish. 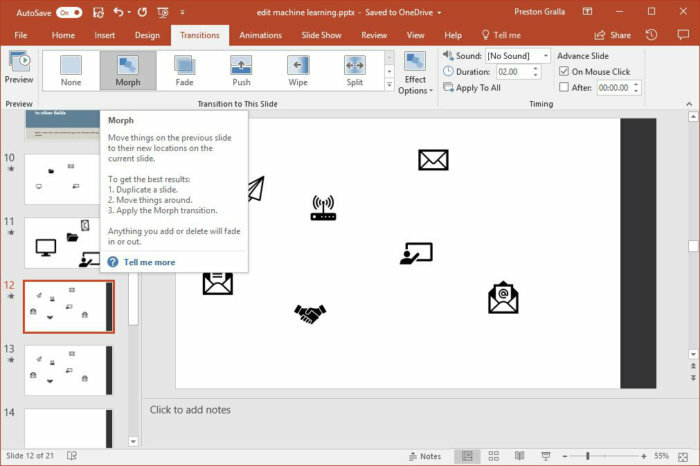 Jared Spataro’s blog post about Office 2019 notes that it will add new visual animations features to PowerPoint, including Morph and Zoom. To that list, we add Designer, because that’s another feature added to Office 365 since the release of Office 2016. 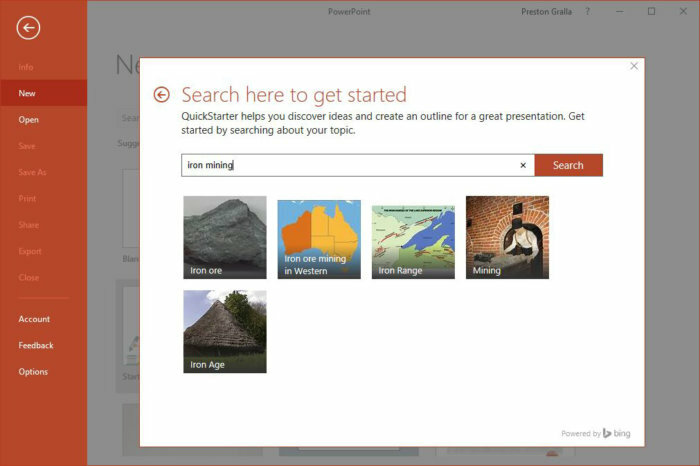 PowerPoint’s Animations tab gives you great tools to create animations between slides and inside slides. But it’s nobody’s idea of easy to use, and creating animations can be quite time-consuming. Morph lets you show motion in transitions and inside slides, but without having to resort to using the Animations tab. To do it, you duplicate an existing slide, and then make changes to the duplicate slide, such as shrinking an element or elements in it, growing them, moving them to new locations or rotating them. Then when you apply Morph to the slide, PowerPoint automatically creates an animated transition between the slides. Onscreen, they look like a single slide morphing, hence its name. To use it, select Morph from the Animation tab. Morph is a simple way to create animations in PowerPoint. Zoom lets you easily link sections of a presentation by creating a kind of visual table of contents that lets you quickly zoom from one to the other. When you’re in a presentation, select Insert > Zoom, then choose the slides you want displayed in the “Zoom” slide. A new slide is created with thumbnails of those slides. When giving a presentation, you’ll be able to jump to that slide instantly by clicking its thumbnail. As for Designer, it’s another example of how Microsoft plans to use artificial intelligence to beef up Office. When you add a graphic to a slide with text on it, Designer looks at the word and the graphic, examines the rest of the presentation, and suggests layouts for the slide that it thinks might be most suitable. Choose a layout, and you’re ready to go. Another A.I. feature that beefs up PowerPoint is QuickStarter, which will be welcomed by anyone who has ever been stymied when confronted with a blank slate when starting a presentation — which means most of us. It gives you a jump-start on your presentation by helping you with research and outline creation. Start by typing in the topic of your presentation, and then choose from a list of subtopics. Once you do that, it suggests a complete set of slides you might want to use, based on Bing searches and data, as well as information gleaned from Wikipedia. Chose which slide(s) to keep, and then select a look for your slides, including a theme complete with background graphics. You’ve now got a good start on your presentation and have only spent a few minutes on it. Don’t expect QuickStarter to excel at every topic. I’ve found it’s hit or miss, although most of the time it’s generally on the mark. To use QuickStarter, when you create a new presentation, click the QuickStarter icon and take it from there. QuickStarter helps you get a jump start on creating a new presentation. Microsoft is a big believer in inking — letting people use pens to write on touch devices for as many applications as possible. You physically draw on the screen using a finger, stylus or mouse, choosing from a selection of onscreen pens with different colors and thicknesses. The company has made frequent improvements to inking in Office 365, and it has plans to add them to Office 2019. The company has said it will add features “like pressure sensitivity, tilt effects, and ink replay,” so expect those to be part of Office 2019. It’s also reasonable to expect that Microsoft will add a host of miscellaneous inking tools it’s introduced in Office 365, such as the ability to edit documents in Word by using a pen — crossing out text to delete it, drawing a circle to select text, and more; the ability to move and resize objects with a pen in all Office applications; as well as a variety of ink effects, including metallic pens and effects like rainbow, galaxy, lava, ocean, gold and silver. There will likely be many new sized pens and colors in Office 2019 as well, given that they have been introduced in Office 365. Also, expect the Ink Replay feature to be introduced throughout Office 2019, as it was in Office 365. It’s particularly useful if you come to a document with a lot of inking on it, and you’re a bit confused as to the purpose of the ink. On the Draw tab, select Ink Replay and it plays back all the inking that was done on the page, from beginning to end. That way you can try to follow the logic and thought processes that led to the inking. Will there be versions of perpetual beyond 2019? As standard practice, Microsoft expects to continue evaluating customer needs and industry trends to determine a plan for future versions of its products and services. Preston Gralla is a contributing editor for Computerworld and the author of more than 45 books, including Windows 8 Hacks (O’Reilly, 2012) and How the Internet Works (Que, 2006).